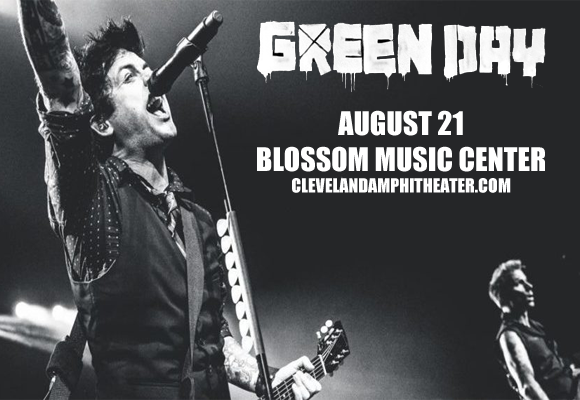 It's time to start a riot, as epic punk rockers Green Day tear up the stage at Blossom Music Center on Monday 21st August 2017, as part of their brand new Revolution Radio Tour! Joined by British rockers Catfish and the Bottlemen, Billie Joe, Mike and Tré are touring 24 US cities this summer, bringing their riff-laden political punk rock back on the road! Hailing from East Bay, California, Green Day is an American punk rock band that was formed by lead vocalist and guitarist Billie Joe Armstrong and bassist Mike Dirnt in 1986. The band has played as a trio with drummer Tré Cool since 1990, when he replaced former drummer John Kiffmeyer. In their early days, they released two albums and two EPs on independent record label Lookout! Records, but found mainstream success when they released their major label debut Dookie through Reprise Records in 1994. Selling over 10 million copies in the U.S. and going on to reach Diamond certification, Dookie was an instant hit both critically and commercially. Green Day's following three albums also fared well, with Insomniac and Nimrod reached double platinum and Warning achieved platinum status. Winner of five Grammy Awards, the band won Best Alternative Album for Dookie, Best Rock Album for American Idiot, Record of the Year for "Boulevard of Broken Dreams", Best Rock Album for the second time for 21st Century Breakdown and Best Musical Show Album for American Idiot: The Original Broadway Cast Recording. They have sold more than 85 million records worldwide, and were inducted into the Rock and Roll Hall of Fame in April 2015.